We’re in good health, good spirits, and have some exciting stuff to talk about, so it’s time for another episode of the NLSC Podcast! In Episode #126, Arcane and I recap the week in NBA Live 16 and NBA 2K16 news, preview some upcoming features here at the NLSC, and discuss a couple of NBA-related topics. 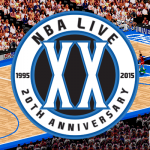 At long last, we’re launching our 20th Anniversary of NBA Live content! On a similar note, Andrew is celebrating his 14th Anniversary as NLSC Webmaster. We also have interviews with Sean O’Brien, and Leftos & JaoSming coming up. Get your questions in ASAP! Recapping the week in NBA Live 16 news, we give our thoughts on the latest preview media, and information on this year’s pre-order bonuses. The first proper gameplay trailer for NBA 2K16 has dropped. Do we feel hyped? Last week delivered us a huge amount of information on MyLEAGUE, MyLEAGUE Online, and MyGM. Naturally, it all came through after we wrapped up last week’s episode, but we’re happy to get it nevertheless. We discuss a few other NBA 2K16 news and notes, including changes to ratings, and the latest retro teams to be confirmed. With gamers looking forward to both NBA Live 16 and NBA 2K16, shots are being fired by both companies. We weigh in on the situation. Metta World Peace could be returning to the Los Angeles Lakers. What do we think of that move? Michael Jordan makes more in endorsements than any current NBA player. We reflect on the brand power of His Airness. We wrap up Episode #126 of the NLSC Podcast with Nick Young’s desire to play for the Boomers, and Andrew Bogut’s response. 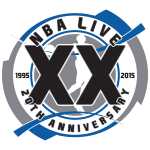 It’s been a long time coming, and it’s arguably a year too late (though NBA Live 95 PC was actually released in 1995), but we’re finally ready to tip off our 20th Anniversary of NBA Live content here at the NLSC! Obviously, we’re still looking to the future and the NBA Live 16 coverage will keep on coming, but at the same time, we’ll be taking the opportunity to look back at 20 years of the NBA Live series. It’s going to be a lot of fun, so stay tuned! On a related note, today marks my 14th Anniversary as the webmaster of the NLSC (or NBA Live Series Center, as was our full name at the time). On August 26th 2001, a couple of months shy of turning 17, I was entrusted to take over one of my favourite websites, and while it hasn’t always been smooth sailing, for the most part it’s been a fantastic experience. It’s something that I enjoy doing to this day, and I’m looking forward to running the site for years to come. As always, a huge thanks to everyone for your continued support! If you’ve been listening to the NLSC Podcast for a while, you may have heard me mention that we’re looking to do some content for the 20th Anniversary of NBA Live. We originally intended to run these features last year – which was indeed the 20th anniversary of the game’s original release – but a few things ultimately got in the way, not the least of which was covering the latest games (which of course remains our priority). However, this year marks the 20th anniversary of NBA Live 95’s PC release, and seeing how PC coverage has been a big part of what we do here at the NLSC, the timing still feels right. The content, which will start rolling out pretty soon, will be running for a few months alongside our other updates, including coverage of the NBA Live 16 (and NBA 2K16) preview season. While the NBA Live series has fallen on hard times in recent years, a lot of us did grow up playing the games and have fond memories of them, so I’m looking forward to reflecting on the good times, as well as exploring the mishaps, and discussing what the series needs to do moving forward. So, what kind of content can you expect to see? Read on to find out!